Here in Singapore, there’s certainly no lack of things to do and see. World-renowned tourist attractions like the highly Instagram-worthy Infinity Pool atop the majestic Marina Bay Sands, and the family-friendly Universal Studios Singapore theme park where there’s fun for all ages, The only thing is that you will need to pay entry fees to see these places. If you’re on a budget, you can always see different sights – after all, there are lots to see in Singapore. In actual fact, there are plenty of free things to see and do that won’t burn a hole in your wallet — you just need to use a little more effort and look a little harder. Fortunately for you, we’ve compiled a helpful list of cheap recreational activities you can do to help you save money, so listen up. Near the city lies one of the best free attractions in Singapore — Gardens by the Bay. It’s hard to miss the towering Supertree Grove structures and conservatory domes when you’re in the area, and why should you? Entry to this man-made park is free every single day, and the Supertrees are truly a sight to behold up close. Pro tip: head down in the evenings when the 50-metre tall trees are lit up and perform a wonderful light show display at 7:45 pm and 8:45 pm. The Singapore Botanic Gardens has been classified as a UNESCO World Heritage Site since 2015, and it has more than just trees and flowers — it has a rich history and culture, and has also played a significant role in conservation and research. With more than 10,000 species and sub-species of plants, surround yourself with nature and learn more about the many different flora and fauna. Entry is free to the main garden, so bring along a picnic mat to chill on the lush green lawns. The Singapore Symphony Orchestra holds free concerts from time to time here too, so if you don’t have money for concert tickets, here’s a wonderful alternative. 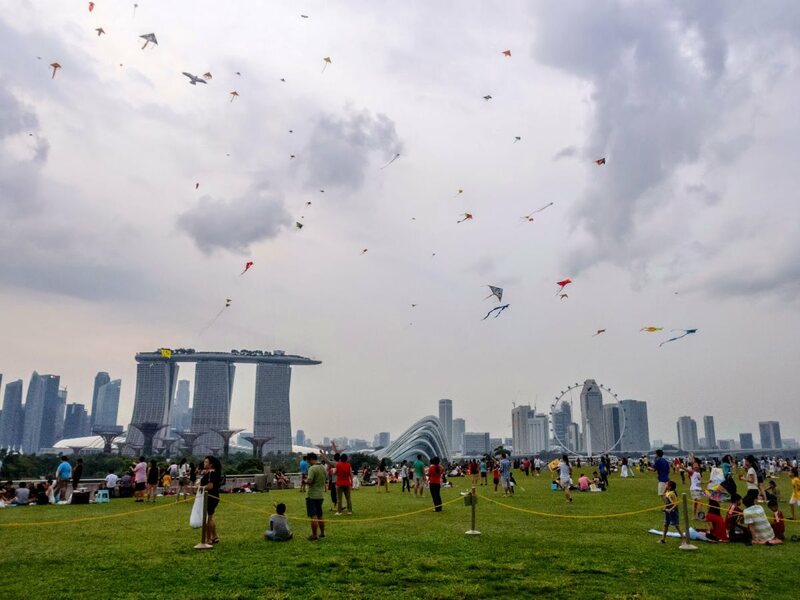 If you’re looking for a good picnic spot, one of the most popular ones is Marina Barrage. Conveniently located near the city, the uppermost deck is a wide-open grassy lawn for people to lay their picnic mats down and enjoy the natural sea breeze. This makes it the perfect place to fly kites, and every weekend you’ll find many families and avid kite flyers here enjoying themselves. Entry is free on weekdays and weekends, and you won’t have to worry about crowds as the area is vast enough to accommodate a full crowd. Love the sun, sand, and sea? Take a short trip ‘overseas’ to Sentosa Island. This little gem is regarded as an island of fun and recreation, and there are a whole host of attractions available — Universal Studios Singapore, Resorts World Sentosa, Singapore Butterfly & Insect Kingdom — but you’ll need to shell out some cash if you want to partake. Instead, grab your swimsuit and tanning oil and head down to any of the beaches. It’s completely free (if you walk into Sentosa via the Link Bridge) so come have a fun day in the sun. If you adore nature and love being surrounded by flora and fauna, the Sungei Buloh Wetland Reserve is a nature reserve located in the North-West region of Singapore. As an ASEAN Heritage Park, it is known to be an important stop-over point for many species of migratory birds, so be sure to bring along your binoculars. You’ll see more than birds — other species include otters, monitor lizards, and various insects can be found here too. If you appreciate arts and culture, the Esplanade Theatre is a must-see as it is considered as Singapore’s premier arts centre. You might think you’ll have to pay quite a bit to enjoy yourself, but fear not — free performances and shows are regularly held for anyone and everyone to enjoy. Cultural skits, live bands, and dance performances are just some of the activities you can see, and if you’re heading down, you might want to check their website for a schedule of events. Singapore is a well-known food paradise — it’s so good that some people consider it a big part of the reason why they moved to Singapore. With four main races living here, as well as the many foreign residents and expats, you can food from all over the world right here. Hawker centres are unique to Singapore and some other Southeast Asian countries — these are open-air complexes where stalls are clustered together, and each stall sells different food and drinks options. The food here is generally inexpensive, and it’s a great way to taste more than one type of cuisine at a time.